Our Serial Port Logger monitors any number of serial ports, captures data from any devices connected to them and logs the information in a customized log file. It implements wide exporting functions: from a classic export to an ODBC database to a direct real-time OPC exporting, or embedding the data to any document via OLE with help of the ActiveX component. This serial port logger offers a wide range of tools to control the data transfer. You can fine tune the baud rate, the amount of bits and stop-bits; you can use software or hardware data flow control, control the data transfer direction and so on. The program works with standard serial ports (RS232) and RS422 or RS485 (needs hardware adapter) protocols and even with all of them simultaneously! One of the crucial requirements to every serial port logger is vast exporting functions. With Advanced Serial Data Logger there's no problem in exporting the data anywhere you want. Thanks to a full-featured ODBC support, the program directly exports data to Excel, MSSQL, MySQL, Oracle, Access or any other ODBC-compatible database. And you can build even more flexible solution because of Advanced Serial Data Logger's ability to work as a DDE or an OPC server. You can even set up our port monitor for a usage in industrial SCADA systems with heavy real-time data acquisition. And even if the target application doesn't support any of these technologies, you still can work with it by sending the data via key strokes. This method works even with ancient DOS-fossils! 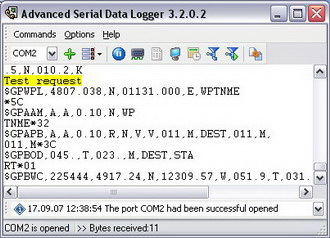 Our serial port logger works under all Windows systems starting from Windows 2000 to Windows 10, both under x86 and x64, and doesn't require any special skills to start working with it. Each configuration step is obviously visualized, so you won't experience problems mastering the program, and even if some question arises, the comprehensive contextual help is at your service always ready to answer! 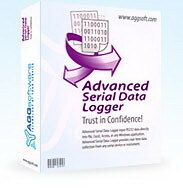 Start using Advanced Serial Data Logger now and you'll never get back to the old-style serial data logging! On-line help. Advanced Serial Data Logger is extremely easy to master; every configuration step is extensively illustrated, while the detailed contextual help ensures you never miss any single nuance. AGG Software offers several license types of our Serial Port Logger software: from Lite to Enterprise edition. Read more here.